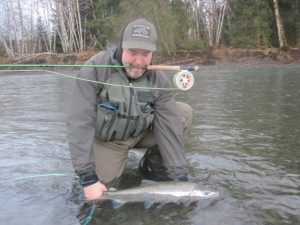 My first Washington steelhead–and the first of five I would land that day. Note: The following two stories (though without all the photos) appeared in my biweekly newspaper column in the Addison Independent. Twenty-five years ago—before I caught my first steelhead trout—I planned a short summer backpacking trip to Olympic National Park with my younger brother Thanh. A day before we were to leave, Thanh broke his ankle (while coaching a youth soccer program in San Francisco) and we had to cancel the trip. I’ve dreamed of getting out there ever since, and this past week I got my chance. Except instead of a summer excursion to an interior alpine lake, I was there for one day of steelhead fishing on the western edge where several rivers flow out of the national park and run the last two dozen miles down to the sea. 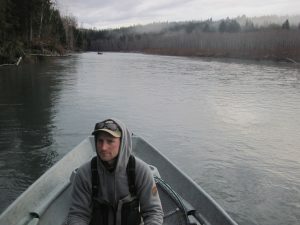 Ryan Bullock of Rain Coast Guides starts our drift down a Olympic Peninsula River on a rainy March day. My guide was Ryan Bullock of Rain Coast Guides. The name of the guide service—or rather the informal name of the region after which the guide service is named—made me nervous. The town of Forks is the rainiest city in the lower forty-eight (which is apparently why author Stephenie Meyer chose to set her famous Twilight Sage series there, despite her lack of experience in the area.) Spotting his pickup by the attached drift boat, I found Ryan at 6:00am at the town’s supermarket, sporting goods store, and café where the specialty drinks all have Twilight-Saga-themed names. (I didn’t know about the names or I might have refused the coffee.) A few minutes later, we hopped in his pickup, and drove along the edge of the national park. We reached our put-in spot on a gravelly riverbank, and as the sky lightened with a hint of dawn, Ryan slipped the drift boat off the trailer and into the water. 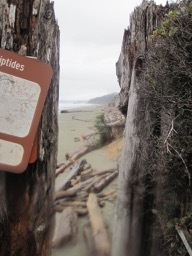 Beaches line the rainy coast–thin bands of sand between the Pacific and temperate rain forests of Olympic National Park. The national park signs identified the region as a rainforest. The first rain didn’t start falling until we’d been fishing for over an hour. I expected it to last all day. It stopped after thirty minutes, and didn’t start again until after lunch when another soaking shower settled in for an hour. That was all the rain action we got that day. Even if we’d gotten more, it was well worth it. The fishing action was fantastic and lasted nearly all day. 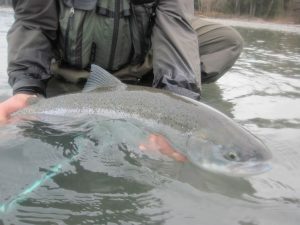 Before the middle of the morning, I’d caught my largest steelhead ever—a thirty-eight inch eighteen-pound hog—and equaled the most I’d ever caught in a day. By the end of the day, I’d hooked nine wild steelhead and landed five, both personal bests. 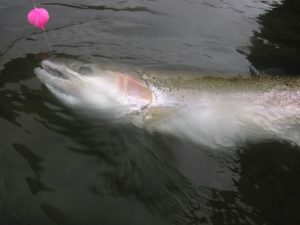 Through a rain-blurrred camera lens, a look at one of several steelhead landed that day along with the “fly” it struck. Our flies were big balls of red yarn. Ryan didn’t know why they worked. Before live bait was outlawed on steelhead streams, anglers used cured salmon eggs. When new regulations prohibited bait, they switched to yarn balls because they look like the egg balls. However, there is no natural food in the river that looks like a big ball of yarn, or of eggs. (In late summer and fall, steelhead will eat salmon eggs, but winter steelhead in this river don’t see anything like it.) I, however, was not going to argue with a guide. That proved wise. 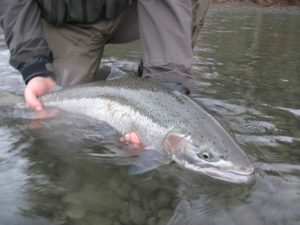 We’d been on the river about an hour and a half when I hooked and landed my first steelhead, a thirty-two-inch male still bright as chrome and fresh up from the ocean. A big hog–the most vividly colored fish of the day (probably from having been longest in the river), and also one of the two biggest. Not half an hour later, I hooked up with one of a couple fish pushing thirty-eight inches and eighteen pounds: a male sporting dark red flanks and a steely red head against a bright green back with hints of gold. It put up a tremendous fight, refusing to be netted for several minutes. When I landed my third fish—a silvery female—without losing one, I started to feel smug. I then lost the next two hookups, illustrating the old adage that pride does go before a fall. When the fishing slowed down for the next hour, I worried I’d blown my last couple chances. I started asking Ryan questions about the river, the impressive log jams along the shore, and the bald eagle sitting on a big dead tree. The river currently flowed at 1,700 cubic feet per second, which is comparable to a typical mid-June flow on Otter Creek, the largest of the three Vermont rivers I think of as my “home waters”. Ever couple years, however, after a good hard rain hammers the mountains, the river floods out at 40,000 cfs. I had to ask Ryan to repeat that number a couple times to make sure I hadn’t heard too many zeros. The impact of the scouring from that volume of water, and the routine dramatic shifts the channel takes in those floods, was evident along the wide gravel plane on both sides. 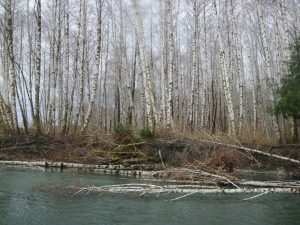 Birches line the shoreline, and downed trees show the power of the occasional floods. glaciers continue to disappear in the Olympics, the loss of a year-round source of cold water will continue to put strain on the successful spawning of the peninsula’s famous salmon and steelhead. But Ryan expressed even more concern for the warming ocean waters that are bringing to the north Pacific a whole new set of species that are both competing with, and preying upon, the steelhead and salmon. By the end of the day, my arms were tired from fighting so many big fish and from casting a salmon rod all day. Despite the arm fatigue, I hope I don’t have to wait a quarter of a century to get back. 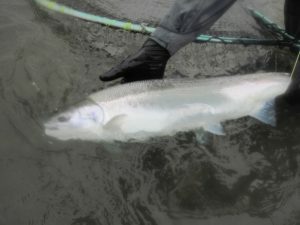 Another chrome bright fish, fresh from saltwater on a rainy Washington day. I had just finished my best ever day of steelhead fishing and I was in the pickup truck with my guide Ryan driving back to town. I commented that days like I’d just had must get him a lot of repeat clients. It wasn’t idle banter. I was already trying to figure out when and how I might get back to that river, and I knew that Rain Coast Guides had already nearly booked most of the March of 2019 more than a year in advance. The comment surprised me at first. After a moment’s thought, however, it made sense—at least to my own experience. I’ve had only a handful of opportunities to fish for steelhead on the famous rivers of Washington, Oregon, and northern California. I’ve never had the flexibility to plan a trip during perfect water condition or wait for when the steelhead were running upriver. My rare steelhead fishing trips generally take place when I can squeeze an extra day or two onto the end of a business trip before catching a redeye flight home and back to work. On this March trip to Washington, I got lucky and hit it perfectly, resulting in the sort of day—and, more importantly, the sort of fish—that stick in the memory a long time. 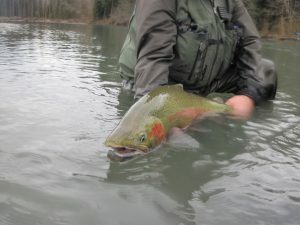 On my previous winter steelhead trips to Oregon, by contrast, I hit it just wrong. Two years ago, the last time I was out there, I caught an unusually dry and cold spell. Several rainless days had just passed, which is a rare phenomenon in coastal Oregon. The snow in the hills wasn’t melting either. The rivers were running low, clear, and cold. And as a result, the steelhead weren’t moving. We could see them all stacked up at the bottom of one long twenty-foot deep pool, essentially unreachable for an angler wielding a fly rod. Three days after I left, the rain fell and my guide had one the best days he’d ever had on that river. The trip before, three years ago, conditions were just the opposite. The rivers were already running high and muddy when I made it down to the coast for one day of guided fishing after a two-day conference. The guide said our outlook was bleak and volunteered to cancel the trip without charging us. We decided to go ahead with it. And, sure enough, as we met our guide a little before dawn a light rain began to fall. For the next three hours the rain gradually increased in intensity. By 10:00am the skies were unloading on us and the wind was kicking up into the gale range. I somehow managed to hook and land two fish, but by 11:00am the river was completely blown out and our day was done. And here is the thing: despite those last two experiences in Oregon—or maybe because of them—I want to get back to that river. I am haunted by those failures. I’m like a gambler. Next time, I tell myself. Next time I’m bound to catch things just right. I’ll have one of those days like our guide had with the clients who came three days after us. It’s the same thing with the rivers I got to fish last year while working on a book in Alaska. I certainly remember the great day I had on one particular river, landing seven rainbow trout at least four of which were the biggest of my life. Sure, I’d like to go back there. But the river I really dream about, the one that still haunts me, is the river where I landed only one rainbow trout and one Dolly Varden char. I keep thinking of all the mistakes I made that day, or all the different strategies I might try, or even just the half dozen spots in the river that still stick out in my memory where I missed a fish or where I know there must have been a fish. I want to get back there and get another chance. I think this is why the quickly approaching opening day of fishing season—in Vermont, the second Saturday of April—is so important. It isn’t just the cabin fever that sets in on Vermonters, and the desire to be outside (though that’s part of it). It isn’t just our favorite honey holes where we can always count on catching a fish (though that’s a part of it too). It’s the memory of our failures, or the failures of the river, or the failures of the weather. It’s the places we didn’t catch a fish. Those are the memories that will haunt me, at least until I can get out and hit those spots again. I’m counting down the days.